SSR Supplier - Wuxi Gold Control Technology Co., Ltd.
Gold is a reputed SSR supplier and manufacturer in China. The supplier is specialized in the research and production of high quality Solid State Relays for ten years, owning reputation from customers all over the world. 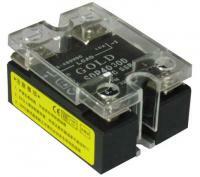 For many years, Gold has been devoted itself to the field of solid state relay manufacturing. Hence, with great profession and years of experience, the SSR supplier is confident in providing quality products to the market. Our products are now with UL, CE & RoHS certifications, which prove our efforts. To bring more and better products that beyond customers' expectation, Gold pushes itself to do better and better. If you would like to know more about Gold and Gold's products, please feel free to send your inquiry to us any time. As a professional SSR supplier, we also offer the most competitive price for you. Helping you is our greatest pleasure!